Distribution. Possibly restricted to northeast India, no known extant population. The holotype of Homalopsis hardwickii is reported to be from India, but the datum is questionable. Two other specimens (BMNH 111.18.1 b, g) that may be H. hardwickii have the locality of “Bengal” but do not agree well with the holotype and the locality information is followed by a question mark in the BMNH catalog. Thus, this species remains to be re-discovered and its distribution to be determined. Diagnosis. Homalopsis hardwickii has a divided loreal contacting upper labials 1–4; two prefrontal scales; 39 scale rows at midbody reduced to 28 posteriorly; one postocular scale and no presubocular scale; 13 or 14 upper labials; 159 ventrals. Homalopsis buccata has a single loreal contacting upper labials 1–4; one postocular scale plus a postsubocular scale; H. nigroventralis has upper labials 1–3 contacting the loreal; one or two postocular scales plus one postsubocular scale; and a reverse color pattern on the venter (dark olive-gray with white spots). H. semizonata has three prefrontals; one postocular and one postsubocular. 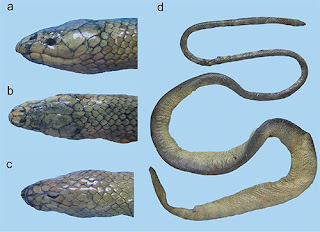 The new species, H. mereljcoxi, has a single loreal contacting upper labials 1–4; 40–49 scale rows at midbody, reduced to 30 or more posteriorly; and two postocular scales plus a postsubocular. Redescription of the Holotype. A male, 511 mm SVL, 172 mm tail; dorsal scale rows 41–39–28; 159 ventrals; 84 subcaudals; 1/1preocular, 1/1 postocular, 1/1 postsubocular, no subocular; internasal small and divided; 2/2 prefrontals; temporal formula 1/1; upper labials 14/13, first six not horizontally divided; upper labials under orbit 5/6; upper labials in contact with loreal 1-4/1-4; loreal divided on both sides. It has a typical Homalopsis pattern with alternating dark brown separated by white saddle-like blotches, the light blotches number 44, of which 19 do not extend to the vertebral line. Material examined. “INDIA” BMNH 1946.1.7.26 (type).